Kids are astounded and delightfully frightened by the enormity and deadliness of sharks. 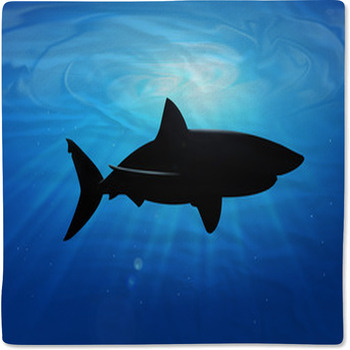 Our shark baby bedding will give your babies the fun of goofy cartoon sharks in silly costumes and poses. 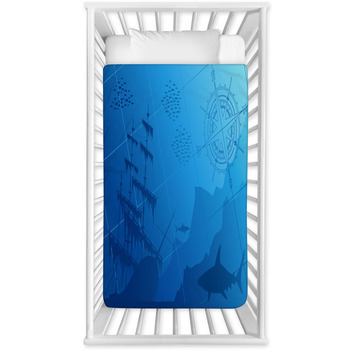 And our toddler bedding will inspire of love of these kings of the ocean in your little boy, with photo images of real sharks swimming and hunting in the depths of the deep blue sea. 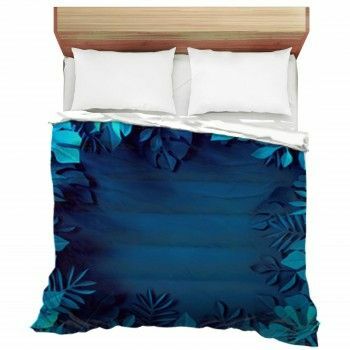 On one crib bedding pattern, a grayish blue shark is smiling a big toothy smile as he comes up behind a pale pink fish. The fish has a scared look in her eyes and is blowing out bubbles as she purses her lips and tries to escape. 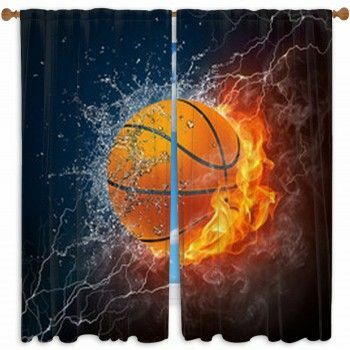 Pair that with a baby blanket that shows a blue-eyed shark standing up and dressed in a black business suit. 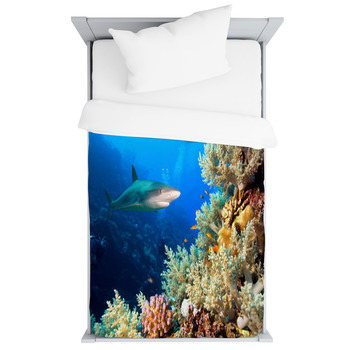 For a gentler view of sharks, select crib bedding that pictures a cute blue baby shark floating along the sea floor over pink coral. 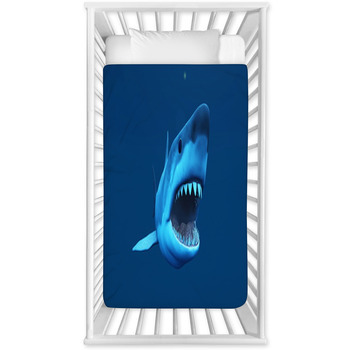 Once your boy get a little bigger, give him toddler bedding that exhibits a great white shark baring its famous teeth as it swims toward you and stares at you with its menacing black eyes. 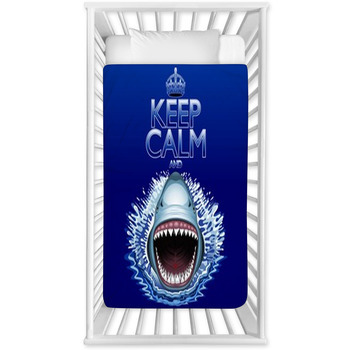 Another shark baby bedding design shows that you aren't safe from these beasts even when you're above the water. Here a great white shark is shown crashing its massive head out of the ocean as it hungrily looks for lunch. 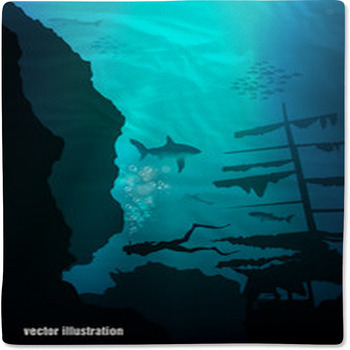 We also have shark baby bedding that displays the bizarre hammerhead shark. This amazing animal is made even more special by being illustrated with turquoise, orange and blue stripes, waves, swirls, loops, spots and floral patterns on its flat head, huge body, wide fins and long tail. 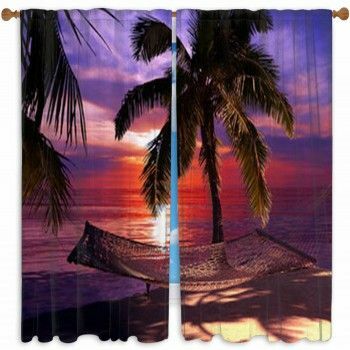 Give your kids the view of an adventurous scuba diving expedition by choosing our shark themed window curtains and wall art for their bedrooms.